All should be working now! Please contact the library if you are still having issues. Having Problems using the Find It search box? Sorry, but we broke something. Unfortunately, the access is still not working (as of the end of Wednesday). 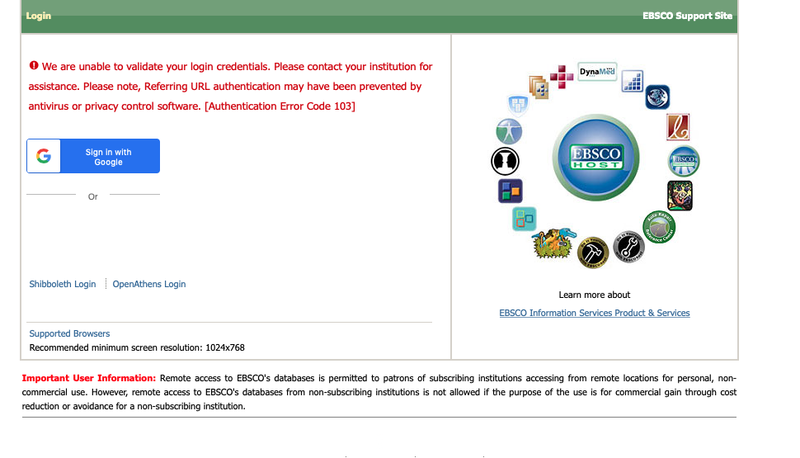 We have reported it to EBSCO and they are working on it but it seems to be a bigger problem than we realized. Or if neither of these are working, you can still access the library databases from this page: https://libguides.ufv.ca/az.php. If you go to an EBSCO database like Academic Search Complete, https://libguides.ufv.ca/databases/academicsearch , you can then choose databases and select all the EBSCO resources that you want. If you are on campus, the Find It box is working without any issues. Join Jan Elsted on her personal exploration of the Art of the Book. Join Art of the Book juror Jan Elsted as she looks at a selection of books from Barbarian Press's title list and speaks about the private press movement from the late 19th century to now. This workshop will focus on design, technical features and aesthetics. 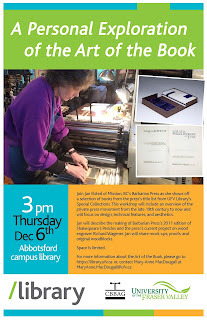 Jan will describe the making of Barbarian Press' 2011 edition of Shakespeare's Pericles and the press's current project on wood engraver Richard Wagener. Jan will share mock-ups, proofs and original woodblocks in her presentation. Registration is not required but space is limited. Jan Elsted earned her BA and MA in English from UBC. While studying for her PhD at King's College, London, she and her husband Crispin discovered letterpress printing, apprenticing with Graham Williams at Florin Press. Returning to Canada in 1978, they established the Barbarian Press in Mission, BC. Jan's press-work, particularly of wood engravings, is internationally recognized. Jan and Crispin were given the Robert Reid Award for Lifetime Achievement in the Book Arts in 2015. Need a break from your studies? 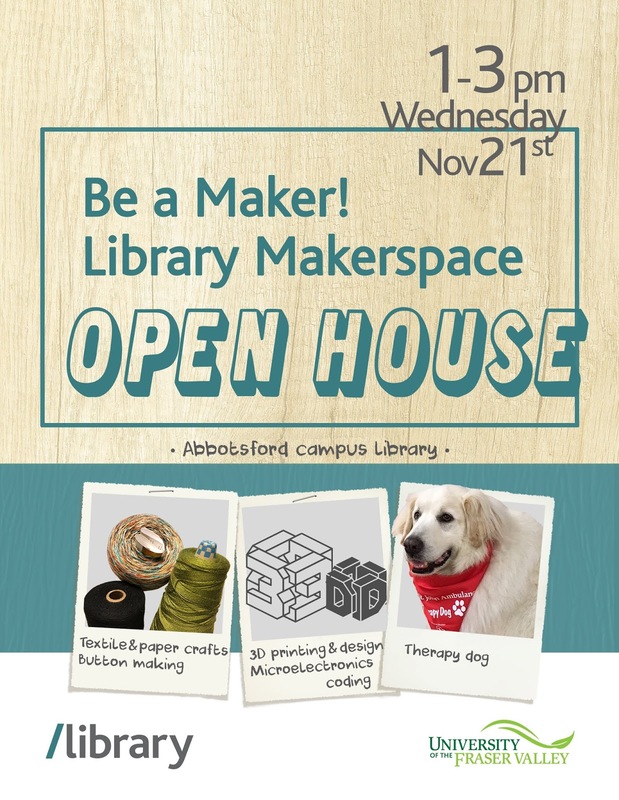 The UFV Abbotsford Library invites students to get creative in our Makerspace. Activities will include button making; textile and paper crafts; 3D printing and design; and microelectronics. Not feeling creative? Come and socialize with a dog! Drop in anytime between 1pm and 3pm on Wednesday, November 21 (G171G). 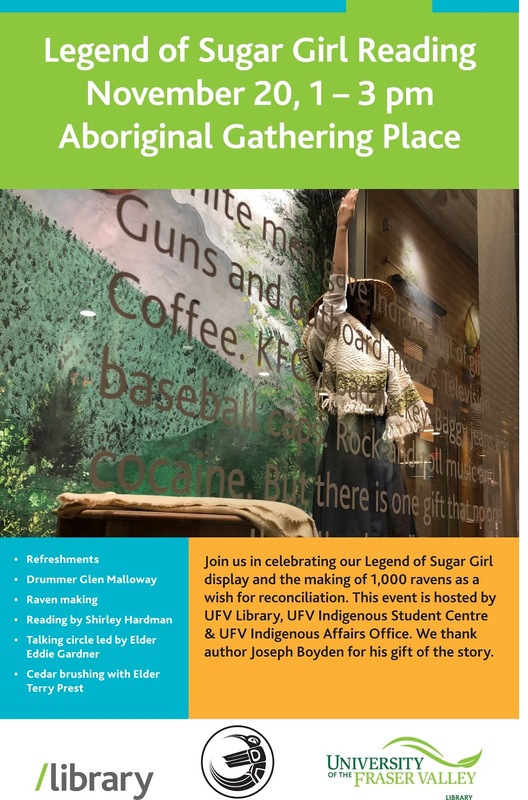 Legend of Sugar Girl Reading, Tuesday, November 20, 1 to 3 p.m.
Legend of Sugar Girl Reading, Tuesday, November 20, 1 to 3 p.m. Shirley Hardman, UFV's Senior Advisor on Indigenous Affairs, will read Joseph Boyden's short story: The Legend of Sugar Girl, in the Aboriginal Gathering Place, on the CEP campus. 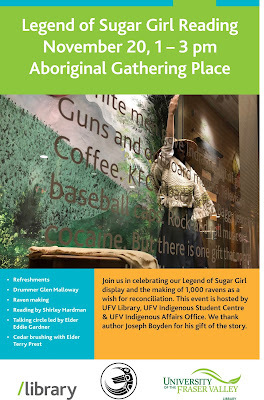 This event is hosted by UFV LIbrary, UFV Indigenous Student Centre and UFV Indigenous Affairs Office. We thank author Joseph Boyden for his gift of the story. 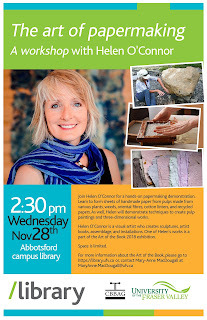 Join Art of the Book artist Helen O'Connor for a hands-on papermaking demonstration. Learn to form sheets of handmade paper from pulps made from various plants, weeds, oriental fibres, cotton linters, and recycled papers. As well, Helen will demonstrate techniques to create pulp paintings and three-dimensional works. No registration is required but space is limited. Helen O’Connor is a Yukon visual artist who makes paper by hand using oriental and local fibres to create sculpture, artist books, assemblage and installation. Her works express a reverence to nature and are influenced by the unique atmosphere of the north particularly light. Originally from Ontario, O’Connor studied visual art at the University of Western and at the Ontario College of Art. During her studies O’Connor was introduced to techniques for oriental and western papermaking. O’Connor utilizes paper creatively as a vehicle of expression and exploration. For more information about the Art of the Book 2018 exhibition, please click here.